CBS Sunday Morning's Faith Salie:"Have you bitten into the Girl Scout Cookie Controversy?" CBS Sunday Morning reports that Girl Scouts of the USA celebrates 100 years of building girls of courage, confidence and character who make the world a better place. 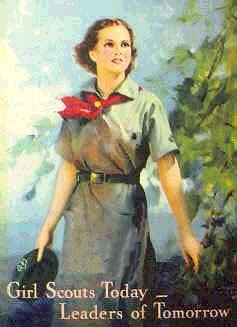 Girl Scouts of the USA was created as an institution based on service, leadership, and love for nature. But being such a large, iconic and trusted brand, the Girl Scout Mission occasionally finds itself the focal point of social critique. CBS Sunday Morning Commentator Faith Salie has an opinion on some of the controversy surrounding Girl Scouts of the USA. In a move designed to focus national attention on girls and the issues they face, Girl Scouts of the USA has announced the launch of ToGetHerThere, the largest, boldest advocacy and fundraising cause dedicated to girls' leadership in the nation's history. The multi-year effort will seek to create balanced leadership — the equal representation of women in leadership positions in all sectors and levels of society — within one generation. Along with this cause, Girl Scouts has launched a $1 billion philanthropic campaign for girls to fuel this effort, and to fund opportunities that enable girls to lead. Ninety percent of funds raised will go directly to services and programs for girls across the nation and in 94 countries globally to help fill critical talent gaps in finance, science, technology and the environmental and global leadership arenas.